Greetings! I started writing my first Sentence A Day reviews in April and also in May. I had fun doing the reviews so today I‘m sharing with you my review of June, and am linking up with several fabulous bloggers who also write their months in a sentence a day. My shout out to Leslie at Once Upon A Time & Happily Ever After for organizing the link-up. 1. Welcomed June with a visit to the outdoor farmers’ market and attended a live concert by the talented Angela Saini and her two friends. 2. Exercised at the gym, took Spanish lessons, and spent some time on travel planning. 3. Swam 50 laps, booked our trip to Spain and Gibraltar, and did grocery shopping. 4. Ran 5K, stretched, and took it easy for the rest of the day. 5. Exercised in the gym, took Spanish lessons, made phone calls regarding our stay in Gibraltar in August, had al fresco dining on the terrace, and savoured a red velvet cake. 6. Practiced yoga, continued to learn Spanish, and read more about Spain. 7. Exercised in the gym, took Spanish lessons, did house work, and made a family dinner that everyone enjoyed. 8. Practiced yoga, met a friend for coffee, and enjoyed Beauty and the Beast movie and popcorn with our neighbours. 9. Exercised in the gym, took Spanish lessons, attended appointments, and had a nice pizza lunch date. 10. Felt great after swimming 52 laps, completing grocery runs, and getting a haircut. 11. Ran 5K in the morning, stretched, and relaxed in the afternoon before making dinner with rapini. 12. Exercised in the gym then went to a business appointment on the 35th floor which had a good view of downtown Toronto. 13. Practiced yoga, and took walks to enjoy the sunshine, greenery, and flowers in my neighbourhood. 14. Exercised in the gym in the morning, and attended a school musical with our friends in the evening. 15. Practiced yoga, reflected on my first half of June, and felt grateful for all of the abundance I have. 16. Made Friday fun by asking a friend to join me at the gym, then continued with my Spanish lessons, and chatted with my sister on the phone. 17. Swam 54 laps, completed grocery runs, and had a picnic with my family. 18. Ran 5K, then relaxed at home to write up my Spring list wrap up post. 19. Worked out in the gym, went to the Luminato festival, treated my eyes with the colourful Famous Spiegeltent, and my ears with the Guaracha Y Sol live concert. 20. Practiced yoga, did house work, and savoured the sweet watermelon of the season, yum! 21. Had a wonderful Wednesday after exercising in the gym, revealing my Summer fun list, and reading other bloggers’ summer lists. 22. Practiced yoga, went to the Luminato festival again, this time to shop at the farmers’ market, and to attend Nick Sherman’s concert. 23. Enjoyed this rainy Friday indoor with one hour at the gym, and lunch with two girlfriends. 24. Swam 54 laps, shopped groceries, did laundry, and started organizing documents for our trip to Costa Rica. 25. Ran 5K, attended two concerts at the Franco-Fete de Toronto festival, viewed Summer Art Exhibitions at Harbourfront Centre, then went home to start packing for our trip. 26. Exercised in the gym then spent more time at our local supermarket than normal due to the reorganizing of shelves while the aisle labels are not updated yet. 27. Took Spanish lessons, went for a 30-minute walk to enjoy the sunshine, and continued getting ready for our trip. 28. Exercised in the gym, checked into our flight online, finished packing for our trip, and boarded a boat cruise around Toronto Island & Harbour for dinner, music and dancing. 29. Got up bright and early for our flight to Costa Rica! 30. Relaxed in our hotel in San Jose, reflected on the first half of 2017, and feel happy and grateful for all that I have. Make July a great month, wherever you are! Be sure to visit the linked up blogs for more fun June reviews. I'm in awe of your exercise program! Thank you, Juhli, for your kind words. I decided to make exercising part of my day (like brushing teeth) and set it as personal goal so I'm responsible for completing it. So much Toronto fun! Are you close enough to downtown activities to either walk or take public transportation? How lovely if so! Yes, we're very close to the city center. I either walk or take public transit to all the special events. It saves so much time and money, and very good exercise, too. I love all the consistent exercise you do! It makes such a big difference in how we feel! I got very sick in May and parts of June, and I'm happy to be finally back to daily workouts. And one day I'll go back to Spanish lessons, too! Glad to hear you're back to your daily workouts. It's one of the best things we can do for ourselves I think. My Spanish lessons are very useful at the moment as we're in San Jose, Costa Rica. Wow, love how much you exercise. What yoga do you do? Do you follow a video or do you just know it so well you can practice on your own? Hope you are having fun on your vacation! Ohhh, so much yoga! You are inspiring me. And how long will you stay in Costa Rica? Is it your first time? We went to Costa Rica in March/April for 3 weeks as my husband if half-Costarican, I love Costa Rica. Such a beautiful country. This is our second time in Costa Rica. We're here for nine days and will leave this Saturday. It is a beautiful country and the people are warm to us. I enjoy yoga as it keeps me flexible and when I focus on my breathing and poses, it's calming. Thanks, Miriam, for visiting and commenting. Hope to hear from you again. Ah, Natalie!! It's so wonderful to read your gratitude!! I need to remember to include that in my posts, because we are so blessed!! I'm so impressed by your workouts!! I have been so lazy lately---ugh!! Enjoy your trip and hope we get to read all about it next month!! Yes, Jodie, we have a lot to be thankful for. I do my "grateful" thinking each night before bed even though I only mentioned it twice in my post. We have a fun day planned for tomorrow before heading home. Will write about our trip in my July review. Ditto what Jodie said. What a beautiful way to end your post and your day! Hi Natalie! So nice to read another person who focuses on their fitness every day!! I'm impressed you are taking Spanish lessons, I really need to. My hubby speaks Spanish, having been born to German parents in Chile. YOu would think some would rub off on me (and I can read quite a bit of it) after being around him and listening to his LAtin American Spanish and having been born and raised in San Diego! Enjoy Costa Rica! This is Terri Webster Schrandt from Second Wind Leisure...I show up as Terri M because google won't let me change to my married name!Looking forward to July! Thanks, Terri, for stopping by and commenting. At first I started learning Spanish just for fun, as a brainteaser in the morning. Then I booked a trip to Costa Rica and Spain and the lessons become more practical. I'm glad I've done the lessons because I'm in Costa Rica and feel confident to order food, ask basic questions, etc. With your husband speaking the language, you'll pick it up so much faster when you choose to do it. Thank you again for the sweet mention. I am so glad this series has grown and that some of the new blood comes from gals closer to my age. The Luminato festival sounds like my cup of tea. When we were in Santa Fe last weekend, there was a mini art show set up in tents among all of the permanent shops and jewelry stores. So many pretty things for sale. You are an inspiration with all of the exercise you do. I have got to get back at it...I keep saying! What do you do for exercise when you're traveling? Anxious to see photos from Costa Rica! Safe travels. When I travel I bring a resistance band and jumping rope with me. They are light but can be effective, in addition to using my own body weight! Imagine doing jumping jacks, lunges, pushups, planks, etc. If where I stay has a clean and safe gym then I use it. I find it easier to keep my daily exercise routine than have a break during a vacation then resume after. For most places that I travel to, I can walk or run, then use the resistance band, a towel, and my body weight to exercise in my room. Great to read your month in review Natalie. Your approach to exercise is to be commended. Great pics too. This was my first month of a sentence a day and it's been fun. Thank you, Deb, for stopping by and your kind words. I'm trying to stay healthy. 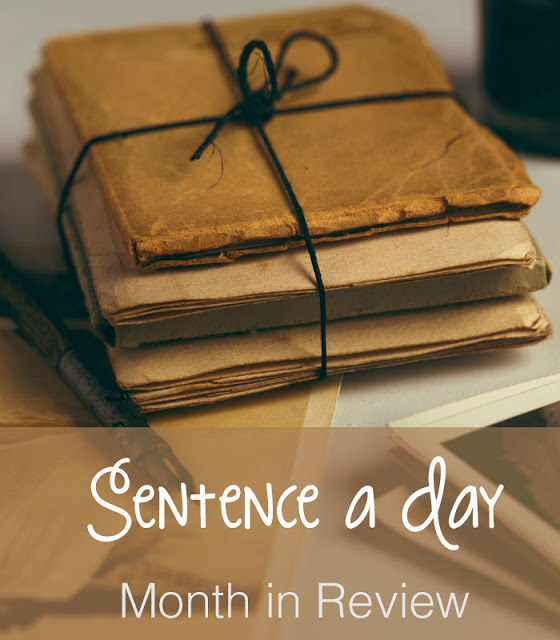 Welcome to the sentence a day link up. Hope your July is going great, and I look forward to reading your next month review. Running, swimming… All that exercise! That alone is inspiring. But as I'm reading your post I'm thinking of how long it's been since I've hiked up to Toronto on the QE when we are so close. I always look for your skyline across the lake when we are in Wilson (in the states)... Not to mention my occasional hops to IKEA in Burlington. Your picture of Toronto harbor and island made me think of a very happy day when we were there with our kids way too long ago. I think we need a family trip to your beautiful city! Yes, please re-visit Toronto, especially in the summer or this summer. We have so many free events to celebrate Canada's 150th birthday. I love my home city and am glad you found it beautiful!